The simplest way to run a Selenium Grid, in a desktop container. Launch any IE, Chrome or Firefox version, including side-by-side IE versions, locally, without set up. Containerised Selenium Grid. # Selenium Grid Containerised Containerized Selenium Grid that supports any major browser (IE, Chrome, Firefox, Safari) without having to install them before. All IE versions supported side by side, on the same machine. The Free Grid supports only latest version of each browser. Please upgrade to test using legacy browser versions. Run your selenium tests locally, without having to use a remote Selenium Grid. See the browsers locally as tests are being executed. Troubleshoot issues faster. 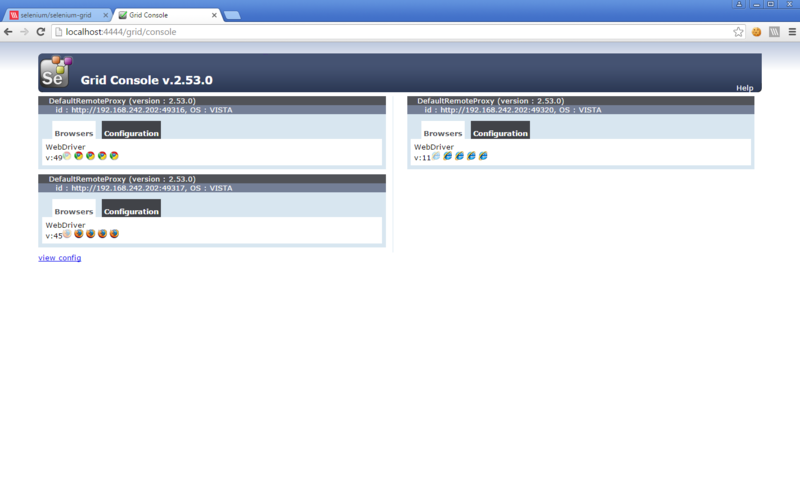 # How it works We've made it easy to run Selenium Grid in a desktop container. Nodes with all browser versions are also containerised and available for your tests. # Setting Up Browser Nodes No setup required! The Turbo Selenium Grid has a small plugin which launches browser nodes on demand, without having to set anything up before launching tests. Chrome, Firefox and IE nodes will be launched automatically when your test executes. # Getting started Start up the Selenium Grid: click the "Run" button above or from the command line, type turbo run oracle/jre-core:8.25,selenium/selenium-grid --isolate=write-copy That's it. You should see a container with Selenium Grid starting up. Next, run your selenium tests. Point them at `http://localhost:4444`, your local grid instance. Chrome, Firefox and IE nodes will be launched automatically when your test executes.